This product was sent to me for test and evaluation purposes and I believe it was recently redesigned. 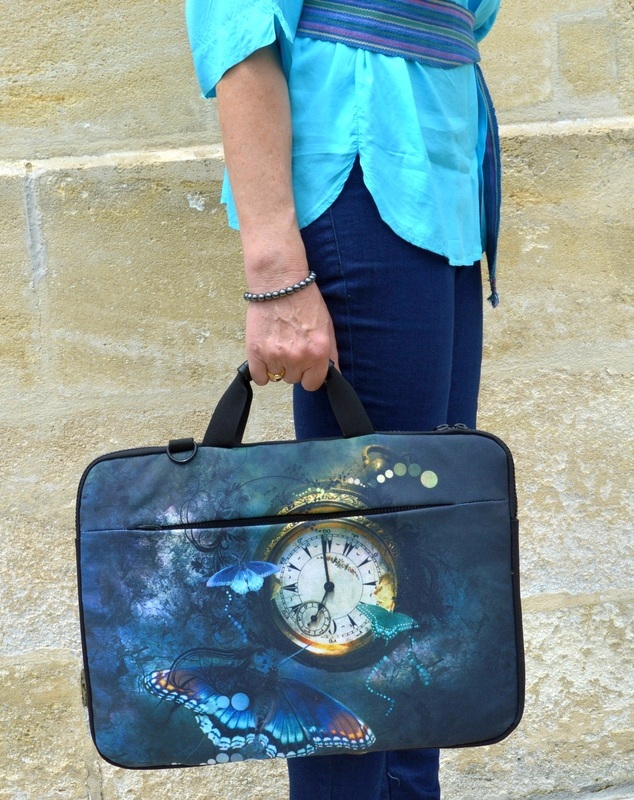 I admit that I fell in love with the look of the bag before even considering whether it would suit my laptop. It turns out that it does, in fact, the 17” size is a very comfortable fit for my 15.6” Toshiba Satellite. The padding feels like a thin but dense layer of foam inside a smooth nylon liner which should be very easy to keep clean (unlike some fluffy liners that can trap dust and dirt). As laptop protection it is the second thickest that I have encountered so far. 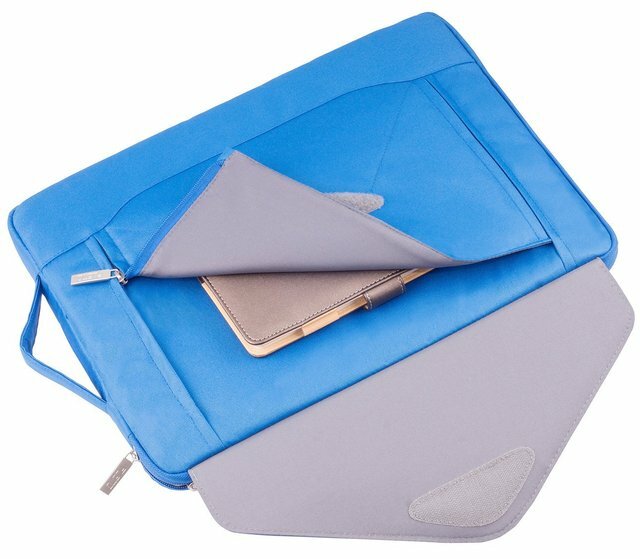 As a nice little extra, quite often missing from this style of laptop sleeve, there is a front pocket secured by a long zip. The pocket spans the width of the bag. 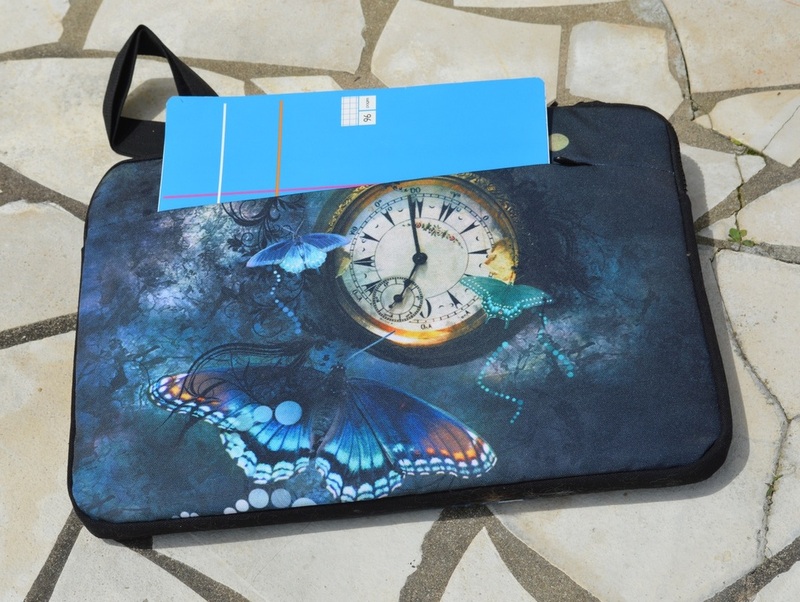 It is ideal for cables, power pack, mouse and mouse pad, and the opening is wide enough for A4 papers, so it can also hold a notebook, sketching pad, documents or other flat items of that size. 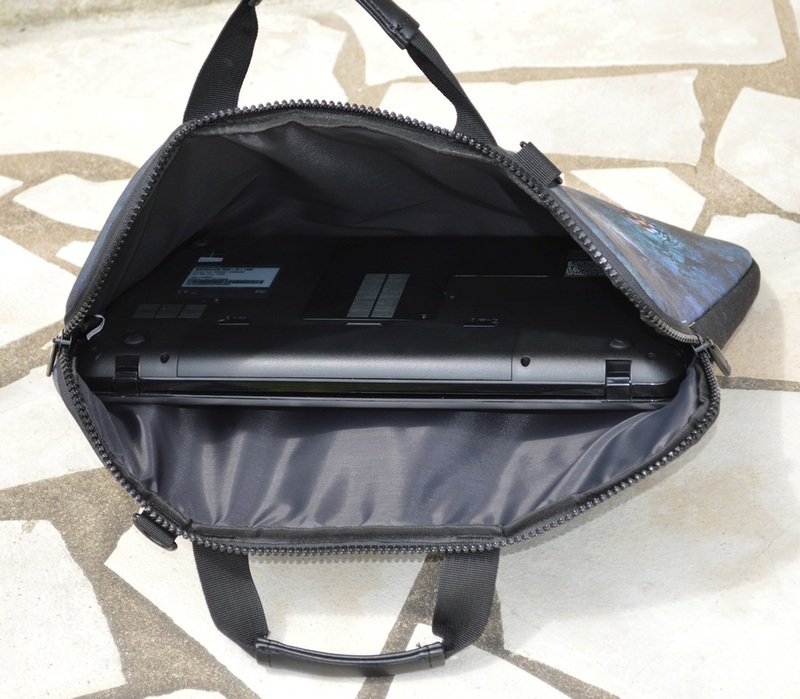 The padded handles allow the bag to be carried with one hand, and the long removable webbing strap can go over a shoulder or across the body and feels solid enough to hold the weight of my laptop easily. The zips are quite chunky and made of hard plastic. They run easily and the whole bag is well made with tight stitches and no visible imperfections. The outer material is a sturdy canvas type fabric, printed with a gorgeous painting of butterflies and an antique pocket watch. The back and front are identical on mine. 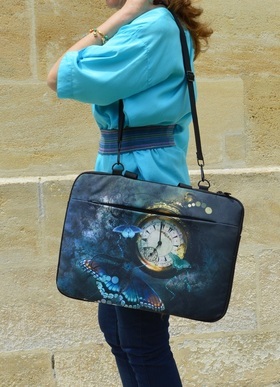 It is available in several original designs, all vividly coloured and quite beautiful. Although each bag is unique, one thing that I think could be done better is to more accurately match the design above and below the zip. Visually, it would be even more attractive. Based on regular usage over the past two weeks, I really love it. It's equally useful as a shoulder bag or as a laptop carrier. This laptop sleeve is even prettier in person than I expected. Out of these adorable designs, the one I choose for my review is the 15.6” Elephant Blue. The strong canvas fabric can be wiped clean with a damp cloth, making this a really practical protective option for a laptop. The designs are eye-catching and vibrantly coloured and should appeal to anyone with an artistic flair. Not the classic choice for a boardroom meeting, but then again, why be like everyone else? 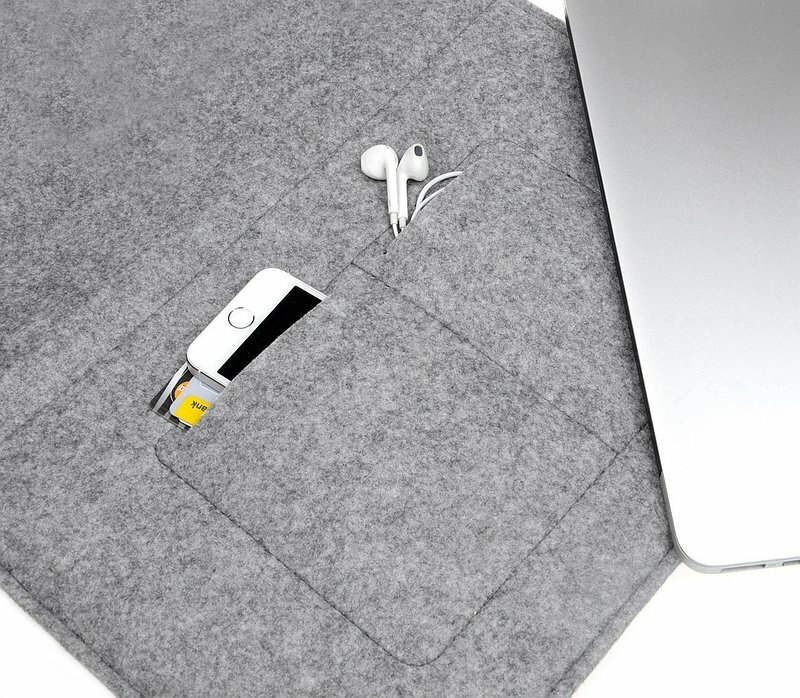 The interior is lined with a super soft faux-fur synthetic material, perfect to keep your laptop scratch-free and cushioned against moderate impact. The two-way zip closes smoothly and there is a small matching bag for a portable phone, mouse or other small accessory. It's a bit too small for my adapter and cable but it might be OK for some other models. 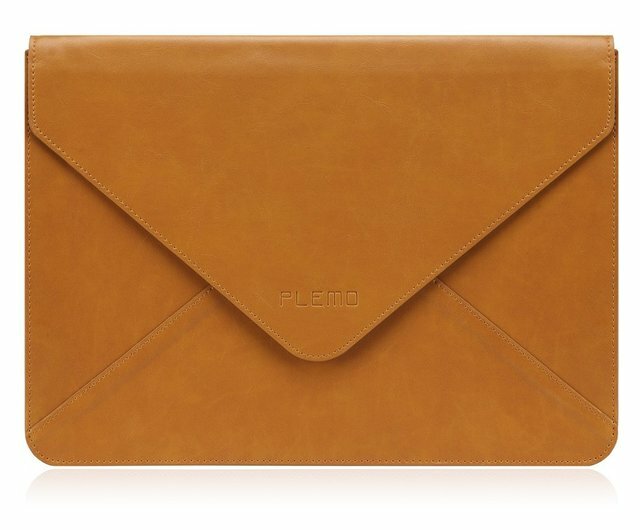 Size-wise, this sleeve is designed for a MacBook Pro Retina and it seems to me to be one of the best fitting covers I have seen for a Mac. I was even able to squeeze my 15” Toshiba Satellite inside, which is considerably chunkier than a Mac. I'm delighted with the sample I was sent to review and I can see myself using this a lot. After several outings, it looks as good as new and has received many compliments from friends and even strangers who notice its distinctive design. This is a stylish and edgy laptop cover to tuck under your arm and, given the tight weave of the fabric, it even offers some rain protection for your laptop. With the look of an antique leather-bound atlas, this protective case really impresses. When I was offered the chance to try one out for review purposes, I did not hesitate. Up close, the PU leather (in other words, synthetic) is a bit too smooth to pass for the real thing, but the stitching, finishing and the strong metal zip closure are all very well done, and the golden embossing is really lovely. The case is rigid, lined with a suede-like material which protects the laptop from scratches and contact marks, but is not really padded and so retains a very slim profile. The fit is snug but correct for a 13” MacBook Air (or a MacBook Pro) with two clear plastic corner strips securing the top (screen) half and reasonably strong elastic for the keyboard base. It's not the most secure attachment in the world but perfectly adequate to keep cover and computer together. There is an identical case available for the Pro Retina, so make sure you buy the correct one for your Mac. The great selling point about this case (apart from its original and elegant appearance) is that you don't need to remove it to use your Mac. Just open the two-way zip, and set up your laptop as usual. The zip fabric allows access to the side ports for peripherals. This is a specialized cover that will protect your Mac in transit and any time you use it but it will not accommodate any accessories, as there are no side pockets. Still, at this price point, it's a gorgeous case that I just love looking at. This review relates to the Inateck MacBook cover Model MP1503. 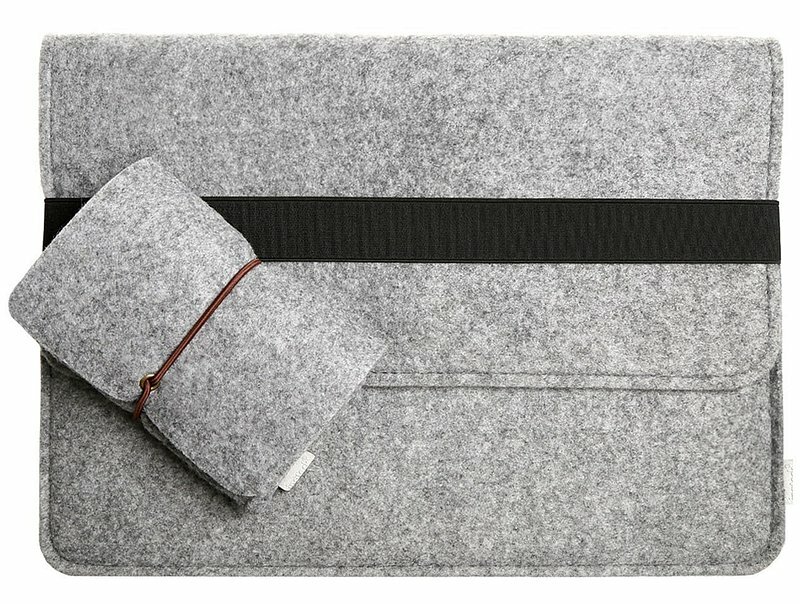 Soft grey felt and an elegant black stripe define this on-trend protective sleeve, designed to fit the 15.4” MacBook Pro Retina but also suitable for other slimline 15” (or smaller) laptops. The interior is lined with a very soft, suede-like fabric, perfect to keep your laptop scratch-free and cushioned against moderate impact. The sleeve is in the shape of an envelope, with a flap folding back over the top and tucked into a length of strong elastic (the black stripe). 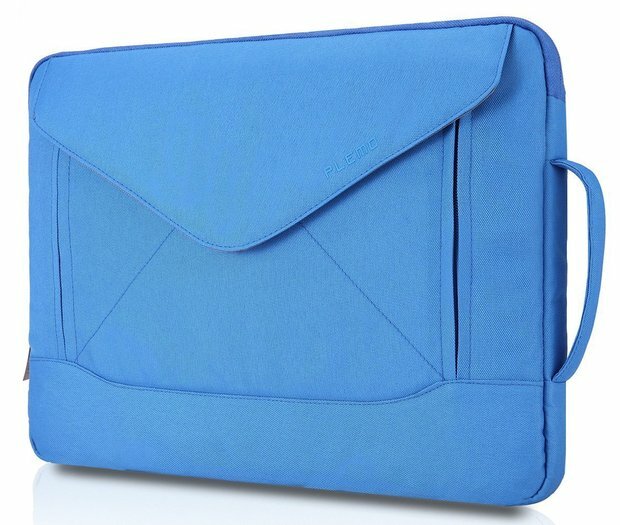 Unlike other envelope-shaped laptop covers, this one has the additional convenience of side pockets. The top one is nearly as large as the whole cover and can be used for tablets, notepads, cables or other fairly flat objects. Two smaller pockets on the bottom are shaped to hold a portable phone, pens, a set of ear buds, or other small, flat bits and pieces. As a welcome extra, Inateck have provided a separate small bag (also secured by a strong elastic band) large enough to take my very big wireless mouse, or my adapter with power cable (just). The sleeve is beautifully finished with good quality stitching in matching grey thread and heavy-duty elastic. Although the fabric has some stretch, it proved too tight for my 15” Toshiba Satellite, but was great for my older 13” laptop. Another excellent product from PLEMO. 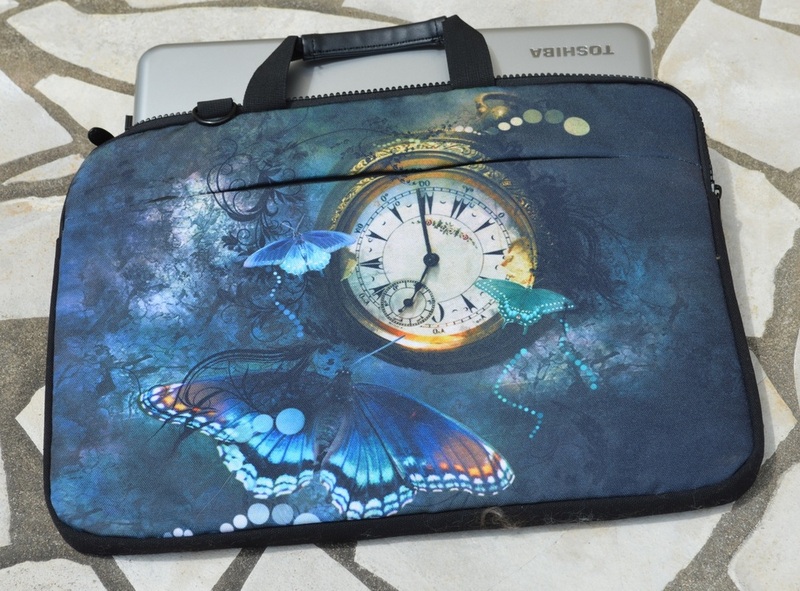 Their range of laptop cases is really very wide and diverse, and it's easy to find something that just fits the bill. For me this bright, robust, well-designed sleeve was the ideal choice to transport my new Toshiba Satellite in style and complete safety. The strong material has a quality look about it and hints at durability. I selected this design because of the additional pockets and straps. There is a short, closely-attached handle on one side for hand carrying, and a much longer, adjustable, luggage-style removable strap to go over your shoulder. The light-grey fluffy interior is generously padded and a perfect size for my laptop which slips inside easily but without unnecessary room to move about. Stitching and finishing are good and tight. The two-way zip which closes the main pocket looks strong and runs smoothly over the corners. The front pocket opens along one short side by means of a similarly strong zip and is secured over the top by the flap of the envelope with a Velcro closure. Its size and shape are ideal for a journal, book, wallet or tablet, but will stretch to accommodate the laptop's power cable or even a mouse. I actually missed the rear pocket (the construction is that tight) but it's there available via another strong zip, well concealed by closely butted seams. It's a little wider than the front one and best suited to flat objects, papers, or a slim book or wallet. Based on first impressions and regular use over the past two weeks, I cannot fault this product. If bright blue is not to your taste, it's also available in a bubblegum pink, dignified grey and dependable (if a little dull) black. 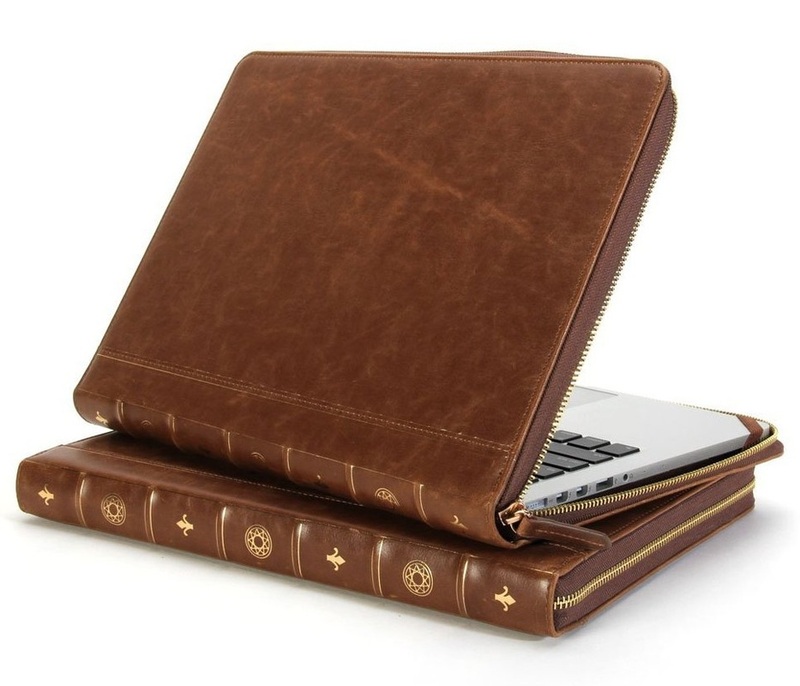 I am really impressed with the elegance and quality of this laptop sleeve. The design is a classic envelope, clean lines edged by strong stitching; the closure is an unobtrusive Velcro “dot”, the size of a coin, under the point of the flap. The case, on arrival, is quite flat but expands by about an inch to accommodate a slimline laptop. The materials are sturdy and well suited to the task: a very attractive smooth imitation leather in a beautiful light tobacco shade for the outside, and a colour-matched super-soft lining with a hint of padding for the inner sleeve. My 13-inch laptop fits snugly inside, well protected when in transit. The PU leather looks durable and it would be easy to wipe it clean with a moist cloth, once it gets a bit more use. Like other PLEMO products, it comes inside a semi-transparent plastic bag, sealed by a zipped closure, very suitable for long-term storage. This classy case is designed to protect your notebook from bumps and scratches when carried inside a briefcase or other larger bag. You could also tuck it under your arm, like a document carrier. In fact, that would be an ideal alternative use. It's sturdy and unbending and, if you get the 13-inch size, you can easily stash an inch of A4 papers or photos inside, or even a slim binder, perhaps a tablet or a portable camera as well. Its limitations are that it doesn't have any carrying straps or handles, nor does it have any extra pockets for accessories. It's strictly a protective and stylish way to carry your laptop and very moderately priced for such quality.